Last week, I found out that the first Friday of every May is International Female Ride Day. The BMW Motorcycle Club organised Kuwait's - actually - the Middle East's first participation in this annual world-wide synchronised campaign. 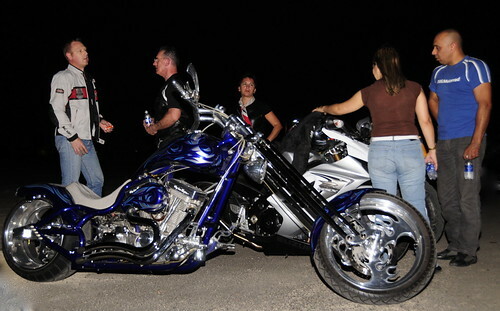 It promotes female motor cyclists and started in Canada in 2007. I found this out because I was kindly invited. I was however on four wheels - and the only wind I felt through my hair was through the sunroof. I closed that too after a while. Riders gathered at the TriStar showroom in Kuwait City. They set off just before sunset and drove to Doha Port - stopping for petrol on the way. The journey was not long, nor was the stop for drinks. The second leg was the ride to the restaurant for dinner. It was great fun watching so many bikes together. A nice bunch of people making the most of the nice weather - before it turns angry. Great pictures. Two of my sons ride Harleys..and say to me, "Nothing like it, Mom." It's not for everyone - but I have to admit I understand the attraction. Thanks for the pictures! It's great to have an event like this in Kuwait! Very nice shots! Too bad I couldn't make it out! I had a few things come up! Most welcome... It is really nice to see such an event here. Must be the same... I would imagine much larger numbers though. I do - but for the club members as they're mostly of them. It really was - and I wasn't on a bike!